Is that shiny new Tesla really just a 1995 Kia in disguise? What's the downside of filling your home with smart devices that report on every detail of your life? Why is that praying mantis wearing 3-D glasses? And Equifax, the company that served up your privacy to hackers last year, has released an app. But does it work? Get answers in today's Geekly Update -- it's jam-packed with the latest tech news. This issue is guaranteed to make you 146% smarter -- you'll see why. Read, think, and, comment! Equifax released an app that enables you to lock and unlock access to your credit file with ease, from your phone. Except it doesn’t work, and there are important differences between “lock” and “freeze,” which the app does not help to explain. A Nest, Inc., smart camera captured a dog starting a house fire while stealing a pancake. Don't worry, your dog wants steak. Chinese police are being equipped with sunglasses that can recognize faces within one-tenth of a second. After being deployed at a rail station for 5 days, it detected 7 fugitives. MultiMate, WordStar, dBASE II, Donkey Kong, Castle Wolfstein, and more gone-but-not-forgotten software classics can be run again on The Computer Museum’s “Historical Software” page. Many other nostalgic, interactive exhibits are there, too. Turns out it is possible to die of a broken heart (“stress cardiomyopathy”). It mostly affects 60-70 year-old women “who have had some sort of emotional or physical stress, loss of a loved one, (or) hardship economically." 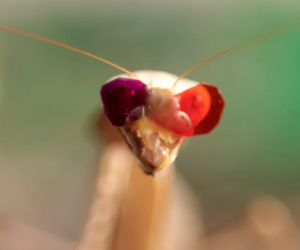 If you think the eyes of a praying mantis are awesome, wait until you see them covered by 3D glasses! NASA’s “On This Day In Space” site presents daily videos, each less than a minute, that will inspire and awe astronomy geeks. A reporter turned her apartment into a “smart everything” home. “Our bed?” asked her husband, aghast. “What can it tell us?” The answer, along with details on how all your connected gadgets may be spying on you, will creep you out. Ever wonder what the Millennium Falcon looked like before Han Solo started modifying it? Google will mark sites “Not Secure” if they do not make HTTPS connections to browsers, starting July 2, 2018. Why do we have to wait so long? Are You an Accidental Spammer? Most recent comments on "Geekly Update - 14 Feb 2018"
Where is the answer to your question about a Tesla being nothing more than a 1995 KIA???? Now I know why Musk shot his Tesla into space. The 'imminent mini ice age' myth is back, and it's still wrong. I just tried the Equifax and it worked fine. The author described many problems she had, but they must have fixed it. I wish the other two credit reporting agency's would develop an similar app. to let the consumer turn off and on access to their data. Chrome, not Google, will mark HTTP sites as insecure. I could have told them that making everything in their house smart enabled would be a bad idea without going through all that. Bob:..."anuther ice age will ENSUE! Did you catch my "anuther"? Doctors are so callous. My father died of a broken heart 5 months after my mother died, as he could not conquer his grief, he stopped eating and drinking, no matter that we tried to be there everyday to bring him out of himself. The official cause of death was the final pneumonia he got in the useless hospital. No syndrome, he died. Leaving 6 shocked grown children, who wanted him to live more years. Callous doctors, callous nurses, they did not note his stays of overwhelming grief and the nurses could not tell me apart from my sister—no one else ever mixed us up. Less callousness, they might have helped him, at his age 67. We daughters came everyday to the hospital for six weeks, hoping he would eat with us. I finally got him to reveal where his mind was, totally on his wife, my mother. His loss. Such callousness.